Imprinted on every tire is a lot of useful information on its size, type, load range, pressure, and date of manufacture. All trailer tires are marked with ST—Special Trailer— and they are not at all like vehicle tires. Trailer tires have strengthened sidewalls that keep the trailer from swaying in turns and allow them to carry the often very heavy combined weight of trailer and its load. One shot offered a glimpse of what appears to be the leg of a second stand. I guessed that was supporting the oar handle. The oar blade was cantilevered beyond the support, but it stayed put even with Len planing as vigorously, so something had to be holding the loom down. In another shot, Len did his “nervous tic” twice and both times the loom of the oar come to an abrupt stop in the same place, confirming that there was something fixed over the loom. Len had to give a noticeable tug to get the throat back on the stand, so putting a slight bend in the oar was what held it in position. Brilliant. The traditional approach has been to cover the blade tips with sheet copper. The copper guards look good, take wear well, and make a good do-it-yourself project. I always put copper guards on my spoon-bladed oars. The tips are thin and have cross grain that makes them more fragile than straight-bladed oars; fortunately, the tips are straight across and easy to wrap with copper. Some of the woodworking tasks we take on in boatbuilding have a lot in common with sculpture, as we carve our way from a block to a purposeful shape. When I started making spoon-bladed oars I used gouges, curved spokeshaves, and my father’s Stanley 100-1/2, a small spoon bottom plane. I later turned to a Makita 125mm disc sander as a quicker way to work concave shapes. It spun at a screaming 4,500 rpm and used stiff resin-fiber discs that cut aggressively. It could shape the power face of a spoon blade when the edge of the disc was set at an appropriate angle to the wood. It made for quick work, albeit dusty and noisy, but the discs didn’t last long and tended to scorch the wood when their grit dulled. In the eyes of our traditionally minded peers on Maryland’s Eastern Shore my wife Jenny and I tread dangerously close to the gates of hell by sailing a fiberglass boat. Our redemption comes by way of the plywood lapstrake tender we built for it. I had installed a robust length of line along the outwale to provide a nice cushion to protect the mothership, but we needed something more to protect our tender from the dinghy dock and the loitering tenders-of-others. I’d been thinking about building a sliding seat for my dory, so I clamped the Ducker slide into it for a test. I knew there would be clearance for the oar handles over my thighs, because I could sit on a throw cushion and still have room. I rowed 15 or so miles in 4 hours, much fartherthan I anticipated. I liked it, and decided to make one for the dory. I dug around my shop and came up with a couple of tracks and a seat. 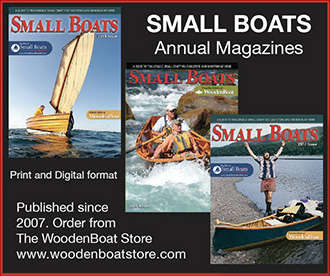 Building and maintaining a wooden boat involves a lot of sanding and a lot of dust. I have an exhaust fan for the shop, a dust collector connected to my tablesaw and jointer, and shop-vacuum connections for the belt sander, disc sander, bandsaw, and random-orbit sander. My latest addition to my arsenal of dust-collection devices is a shop-built downdraft table. It comes in handy capturing the dust from small pieces created by hand-sanding or that escapes the random-orbit sander. You may think vacuum-bagging is intimidating but it is an easy multi-purpose technique that’s within reach of most amateur boatbuilders. While vacuum-bagging an entire hull may be beyond the means and requirements of the home boatbuilder, there are lots of small parts that would benefit from a simple vacuum system. Mud pattens have been in use for centuries and are effective for walking on mud. They’re squares of wood or plywood with three cleats on the bottom, and two loops of thick rope on top. A separate length of lighter rope binds the thicker rope over the boot heel and instep. It’s best to use line that is not slippery, such as nylon, so the knots don’t loosen. I once looked forward to camp sweets just as much as our young daughters do now. Pineapple-cherry dump cake baked in a Dutch oven was a staple of my Boy Scout troop campouts. The recipe was easy: dump a can of pineapples and cherry-pie filling in the Dutch oven, top with a cake mix, put the lid on and cover oven with coals. Dutch ovens can be used to make a wide variety of cakes, pies, and casseroles.